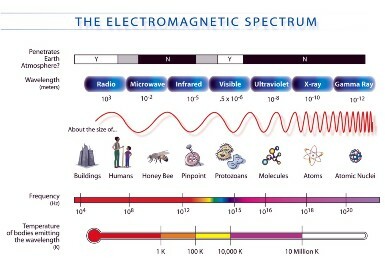 Electromagnetic waves are classified according to their frequency. The different types of waves have different uses and functions in our everyday lives. The most important of these is visible light, which enables us to see. 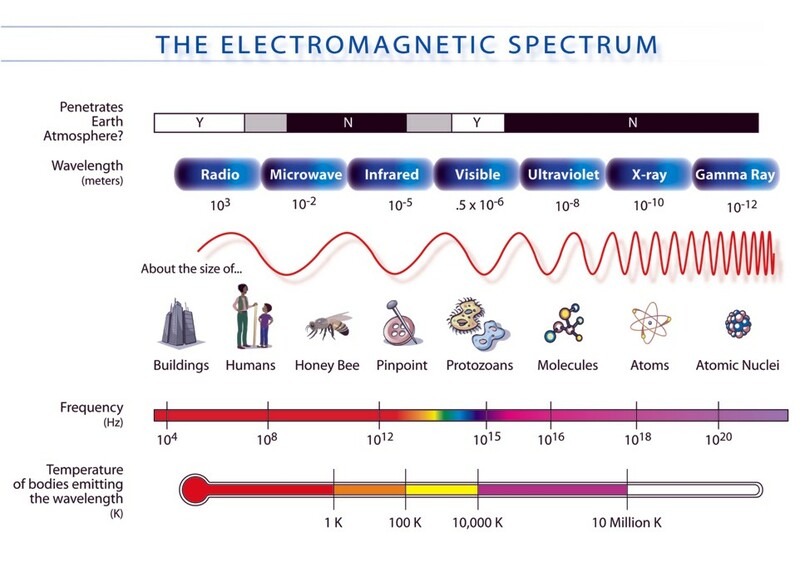 Radio waves have the longest wavelengths of all the electromagnetic waves. They range from around a foot long to several miles long. Radio waves are often used to transmit data and have been used for all sorts of applications including radio, satellites, radar, and computer networks. Microwaves are shorter than radio waves with wavelengths measured in centimeters. We use microwaves to cook food, transmit information, and in radar that helps to predict the weather. Microwaves are useful in communication because they can penetrate clouds, smoke, and light rain. The universe is filled with cosmic microwave background radiation that scientists believe are clues to the origin of the universe they call the Big Bang. Between microwaves and visible light are infrared waves. Infrared waves are sometimes classified as "near" infrared and "far" infrared. Near infrared waves are the waves that are closer to visible light in wavelength. These are the infrared waves that are used in your TV remote to change channels. Far infrared waves are further away from visible light in wavelength. Far infrared waves are thermal and give off heat. Anything that gives off heat radiates infrared waves. This includes the human body! The visible light spectrum covers the wavelengths that can be seen by the human eye. This is the range of wavelengths from 390 to 700 nm which corresponds to the frequencies 430-790 THz. You can go here to learn more about the visible spectrum. Ultraviolet waves have the next shortest wavelength after visible light. It is ultraviolet rays from the Sun that cause sunburns. We are protected from the Sun's ultraviolet rays by the ozone layer. Some insects, such as bumblebees, can see ultraviolet light. Ultraviolet light is used by powerful telescopes like the Hubble Space Telescope to see far away stars. X-rays have even shorter wavelengths than ultraviolet rays. At this point in the electromagnetic spectrum, scientists begin to think of these rays more as particles than waves. X-rays were discovered by German scientist Wilhelm Roentgen. They can penetrate soft tissue like skin and muscle and are used to take X-ray pictures of bones in medicine. As the wavelengths of electromagnetic waves get shorter, their energy increases. Gamma rays are the shortest waves in the spectrum and, as a result, have the most energy. Gamma rays are sometimes used in treating cancer and in taking detailed images for diagnostic medicine. Gamma rays are produced in high energy nuclear explosions and supernovas.